Pond front with private beach rights, dock, rowboats and swim platform. Open and airy, 2 BR, 1BA cottage nestled in shady pines overlooking pond. Central Eastham location, 1/4 mi from the National Seashore Visitors Center means quick and easy access to ocean and bay beaches as well as the bike paths. Cottage is one of 10 that share a private fresh water beach with a dock with rowboats and a swim platform. Also includes access to the playroom, horseshoes pits, and basketball courts. Recently remodeled, it features lofty cathedral ceilings, central fireplace, hardwood floors and a roomy bathroom with a full tub. Includes charcoal grill, coffee maker, gas stove/oven, full refrigerator, microwave and fully equipped kitchen. WiFi access. Please note that In-Season rentals are weekly from Saturday to Saturday and that linens and towels (excepting dish towel) are not provided. Each of the two bedrooms has a small window unit. A direct vent gas heating unit is available for the shoulder seasons or cooler nights. There is also basic cable TV. A private patio out back overlooks the pond with very little evidence of other houses. Nature is very much on display. It was perfect for us. I had a conference at the Sheraton which was just around the corner. The pond was warm whereas the beach was still cold at the end of June. It was quiet and scenic. This is our second year staying at this adorable cottage! We absolutely love it! Perfect location to explore the Cape but we hardly ever leave the pond! Our children love the floating dock and boats and we dont even use the internet or the TV when we are here! The beds are comfortable and the kitchen well stocked. We love the view and listening to the birds- you feel like you are in a treehouse! Thank you Tamara, We strive to provide a clean comfortable and cozy place for you to enjoy your vacation. If you did want to explore, some of the capes best beaches and the attractions are a short bike ride away. We really enjoyed our few days at Nauset Haven and found the cottage to be just as described. The view out over the pond at any time during the day just made one feel at one with nature. From the bike shop nearby we rented bikes and rode down to Orleans and Harwich along the trail on a lovely sunny day. It was just perfect also to visit the lovely beaches of the National Seashore and just a short trip to Provincetown. Highly recommended. We had great time at Cape Cod and staying at this cottage was part of it. It is a beautiful cottage, very spacious for 4 people. The open floor plan, vaulted ceiling and many big windows, gave it a much larger feel to it. It was great to wake up in the morning and overlook the pond. At night the full moon lit up the sky and reflected off the pond. The teenage boys loved fishing on the pond, from both the dock and the row boats. They were in search of the big one that got away! The cottage location was great. Even though it is located on Rte 6, it is still private and quiet. Easy to bike to the Cape Cod Rail Trail, and ride to the Salt Marsh trails. The ocean and bay beaches were close by. Sunset at Rock Harbor, Eastham/Orleans is amazing. We also traveled easily to Chatham, Sandwich and Provincetown. Shopping and restaurants in Orleans were convenient. I highly recommend this place to everyone. The RELAX allowed us to do just that- relax. This was a very nice cottage and the price point was more than fair. We have three older children (15,13,12)...and all 5 of us were comfortable. It was really close to several beaches as well as family activities and eateries. Couch was a futon and worked out just fine. Pond was okay for swimming....rowboatimg ....maybe bring a raft or two for kids. Views were very nice and the trees kept the place from getting too hot. Families and couples will like this place for sure. 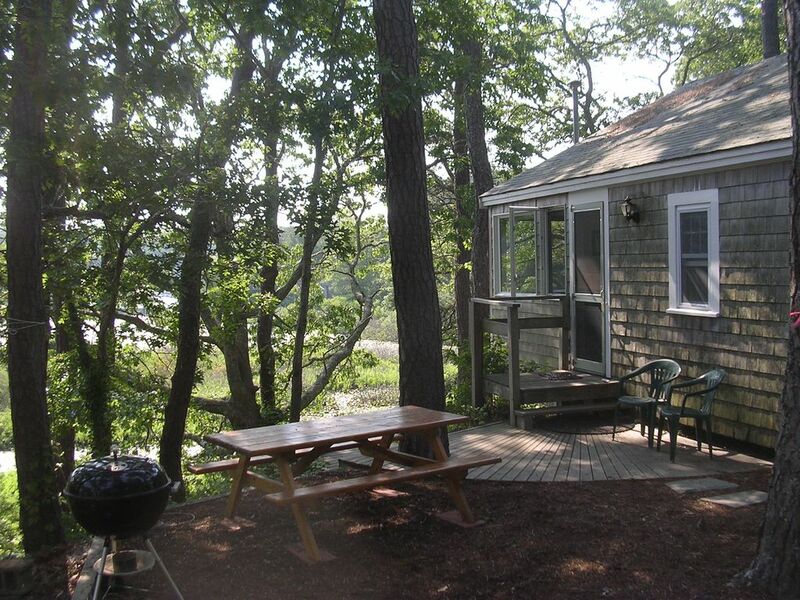 Great location right on a pond, 1/4 mile from National Seashore Visitors Center and the 30 mile long Cape Cod Bike Trail, 2.5 miles from the Coast Guard and Nauset Lighthouse ocean beaches, 2 miles from the protected bayside beaches that expand out to 1/4 mile at low tide. Also very convenient to restaurants, ice cream, mini-golf and shopping in the quaint Orleans or Wellfleet and centers. If you still need something more, Provincetown, and Chatham are short and scenic 15-20 mile drives. * Cape Cod National Seashore Visitors Center 1/4 mile away....check out 'The Sands of Time', a 15 minute documentary about the geological history of the Cape, which will be very relavant after the severe beach reconfiguration that took place this winter. * Walks on the beach from Coast Guard beach to Nauset inlet...even better at low tide. * Bike rides up and down the Bike Trail. If you like mountain biking, there are a myriad of fantastic trails in nearby Wellfleet that are fast and smooth and bring you to secluded kettle pond swimming holes... can you find 'Spectacle Pond'!?!? * Sunsets at the bayside beaches.. bring a cooler. And, if you're an early bird, sunrises and coffee on the top steps of the Nauset Light Beach. * A moonlit row around the pond listening to the peace and quiet and occasional fish breaking the surface. * Early (very early) sunrise walks on the beach when the sea is calm and blue fish are still blitzing... and the sunset ones too! Please note that the 'turn-over' day is Saturday. Weekly rentals are from Saturday to Saturday. Rates are subject to change until confirmed.